within the body and psyche." See below for more reviews. 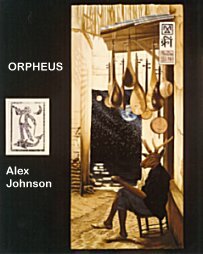 "Evocative of ancient and modern imagery is how I would describe ORPHEUS by Alex Johnson, The title cut led me on a long involved, pleasurable, mind journey! I found my mind bouncing from one memory to another, as well as to mind pictures that were not of memory. It was a relaxing and reflective experience. Another cut, "Vision at the Pyramids", spawns visions of ancient flavor and intrigue. "Dragonfly" brought imagery of camping in the sticks, by a river or swamp; while "The Kiss", a rather romantic and sensual number, brings a sense of delving very deeply into self and into the other." " Titles of some of the other cuts bring to mind a sense of their essence- "Mind at Large", "Deep Space", "Happy Shepherd", "Meditation", and "Adagio". It's a wonderful album I'll listen to many times; all of it rather visually colorful." "ORPHEUS is a soothing beneficent collection of musical pieces that give a feeling of sprinting then waltzing through a forest of trees. The tempos vary taking the listener through a wide range of pleasant emotions ." The music is masterfully done and is very good for healing and meditation. Although my experiences won't necessarily be any one else's, the compositions stir up creativity and have profound effect upon and within the body and psyche. The individual pieces guide you towards your own experiences. Orpheus, son of Apollo, when you play upon your Lyre, it's so beautiful that wild beasts are soothed, trees dance and rivers stand still. 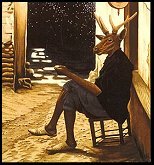 The cover and music fit the title well bringing an air of Shakespearean fantasy to the spirit.."
"Orpheus' lyre could charm even rocks to sing, yet he ended up losing his wife, being torn limb from limb by a bunch of maidens, and finally having his head and instrument placed in the night sky. Surely one of the most colorful and exciting myths ever, it has inspired artists as diverse as Jean Cocteau, Debussy and now, multi -instrumentalist Johnson. Fans of his soothing, graceful melodies may find this formula departure easier to enjoy by knowing that the material included was recorded in several 1988-1990 sessions; the end result blends synth, violin, recorder and bass into a collection of moody songs arranged in the New Age/Classical style. Complex, fascinating, and at times spell, binding, it is an ambitious theme that usually succeeds."